Whether you are running a successful business, heading a non-profit organization, or working behind the scenes at a medical clinic or hospital in Santa Rosa Beach, Florida, your organization shares something with just about everyone else: the need to organize and store supplies properly. Patterson Pope believes businesses need unique and varied storage options for their property. While a warehouse may need cantilever shelving, hospitals and medical facilities would benefit more from sterile stainless steel cabinets and shelving options. Mobile storage works great for Santa Rosa Beach companies that have to store a large amount of items, including paperwork, in a small space, while modular casework provides area businesses with flexibility. At Patterson Pope, we work with our clients to design the storage solution that meets their specific storage requirements, rather than trying to fit our clients into a one-size-fits-all storage mold. The economy in Santa Rosa Beach is led primarily by the management, business and finance niches. Patterson Pope’s storage solutions are ideal for these. Modular casework, for instance, provides the flexibility to change the office space as needed, while rotary or mobile cabinets, as well as rotating carousels, allow more files to be stored in a smaller space. Mailroom furniture, mail carts and even mobile storage will work together to make your office run more efficiently. Our team can help you get started by building a custom storage solution for your business needs. From law enforcement to hospitals and even libraries, all types of companies and organizations in Santa Rosa Beach will find the storage solutions they need with Patterson Pope. We also serve athletic programs, public safety organizations, retail stores and warehouse storage facilities. We offer everything from weapons and gear storage to expandable and rotating shelving options. In other words, if you have a serious storage problem, we can help. Don’t let your supplies be a problem for your company. From complex high-density storage to simple and attractive modular casework, businesses trust Patterson Pope to provide all of their storage needs, with custom-tailored solutions that provide a perfect fit. As noted above, several industries in the Jacksonville area count on Patterson Pope. We have the experience, knowledge and skill to overcome any high density storage dilemma you may currently be facing. Call us today! You will be happy you did! The team at Patterson Pope proudly provides mobile shelving and high density storage solutions to the greater Santa Rosa Beach area including Destin, Miramar Beach, Panama City, Pensacola and other surrounding areas. 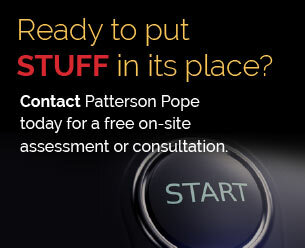 If you have a need for better commercial storage, contact Patterson Pope today.